Syria (Arabic : سوريا‎Sūriyā), officially the Syrian Arab Republic (Arabic : الجمهورية العربية السورية‎al-Jumhūrīyah al-ʻArabīyah as-Sūrīyah), is a country in Western Asia, bordering Lebanon to the southwest, the Mediterranean Sea to the west, Turkey to the north, Iraq to the east, Jordan to the south, and Israel to the southwest. A country of fertile plains, high mountains, and deserts, Syria is home to diverse ethnic and religious groups, including Syrian Arabs, Greeks, Armenians, Assyrians, Kurds, Circassians,  Mandeans  and Turks. Religious groups include Sunnis, Christians, Alawites, Druze, Isma'ilis, Mandeans, Shiites, Salafis, Yazidis, and Jews. Sunni make up the largest religious group in Syria. A republic is a form of government in which the country is considered a “public matter”, not the private concern or property of the rulers. The primary positions of power within a republic are not inherited, but are attained through democracy, oligarchy or autocracy. It is a form of government under which the head of state is not a hereditary monarch. 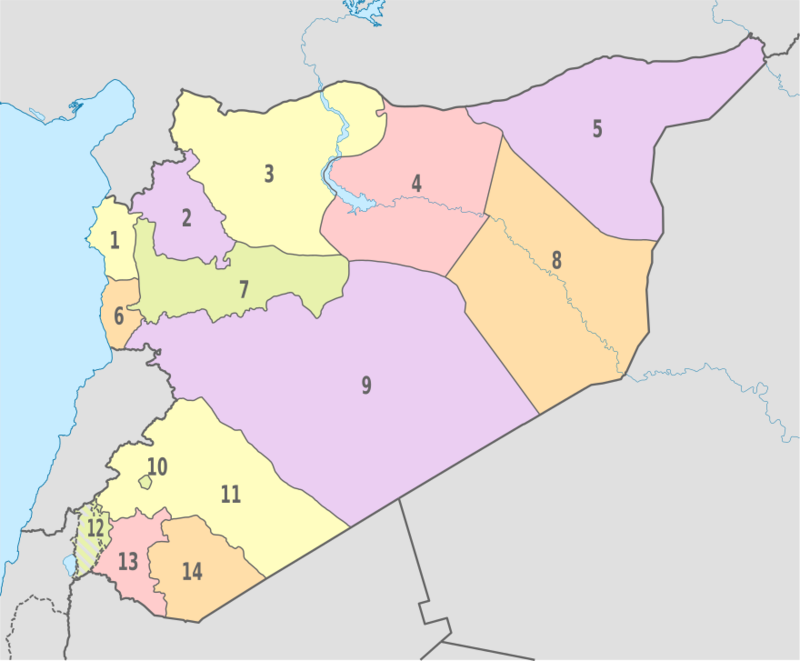 Syria is a unitary state, but for administrative purposes, it is divided into fourteen governorates, also called provinces in English. The governorates are divided into sixty districts, which are further divided into subdistricts. The nawāḥī contain villages, which are the smallest administrative units. 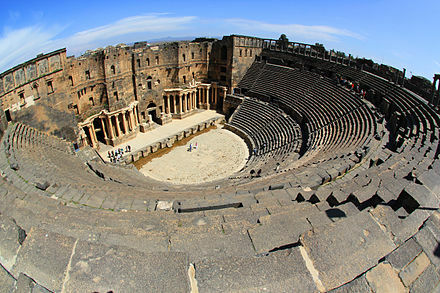 In English, the name "Syria" was formerly synonymous with the Levant (known in Arabic as al-Sham), while the modern state encompasses the sites of several ancient kingdoms and empires, including the Eblan civilization of the 3rd millennium BC. 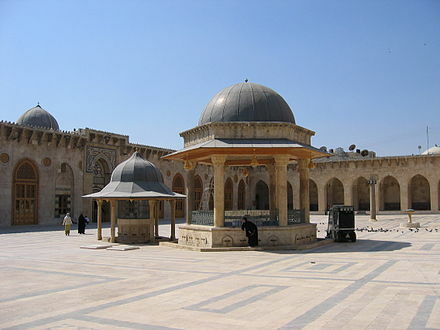 Aleppo and the capital city Damascus are among the oldest continuously inhabited cities in the world. In the Islamic era, Damascus was the seat of the Umayyad Caliphate and a provincial capital of the Mamluk Sultanate in Egypt. 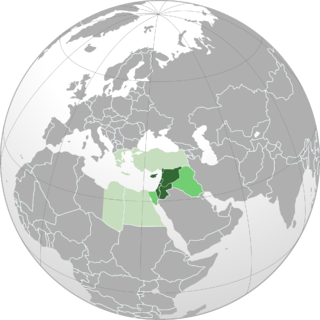 The modern Syrian state was established in mid-20th century after centuries of Ottoman and a brief period French mandate, and represented the largest Arab state to emerge from the formerly Ottoman-ruled Syrian provinces. It gained de-jure independence as a parliamentary republic on 24 October 1945, when Republic of Syria became a founding member of the United Nations, an act which legally ended the former French Mandate – although French troops did not leave the country until April 1946. The post-independence period was tumultuous, and a large number of military coups and coup attempts shook the country in the period 1949–71. In 1958, Syria entered a brief union with Egypt called the United Arab Republic, which was terminated by the 1961 Syrian coup d'état. The republic was renamed into the Arab Republic of Syria in late 1961 after December 1 constitutional referendum, and was increasingly unstable until the 1963 Ba'athist coup d'état, since which the Ba'ath Party has maintained its power. Syria was under Emergency Law from 1963 to 2011, effectively suspending most constitutional protections for citizens. 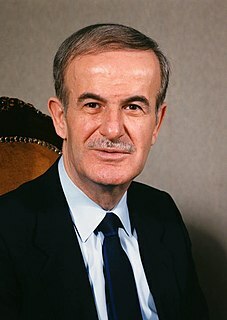 Bashar al-Assad has been president since 2000 and was preceded by his father Hafez al-Assad,  who was in office from 1971 to 2000. Ebla was one of the earliest kingdoms in Syria. Its remains constitute a tell located about 55 km (34 mi) southwest of Aleppo near the village of Mardikh. 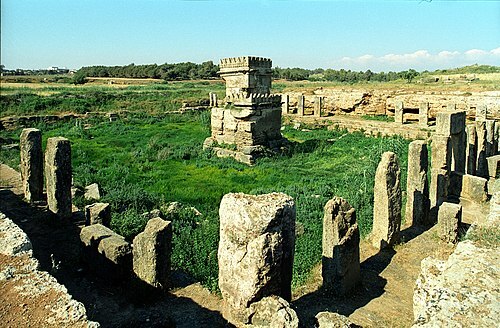 Ebla was an important center throughout the 3rd millennium BC and in the first half of the 2nd millennium BC. Its discovery proved the Levant was a center of ancient, centralized civilization equal to Egypt and Mesopotamia and ruled out the view that the latter two were the only important centers in the Near East during the early Bronze Age. The first Eblaite kingdom has been described as the first recorded world power. Since March 2011, Syria has been embroiled in an armed conflict, with a number of countries in the region and beyond involved militarily or otherwise. As a result, a number of self-proclaimed political entities have emerged on Syrian territory, including the Syrian opposition, Rojava, Tahrir al-Sham and Islamic State of Iraq and the Levant. Syria is ranked last on the Global Peace Index, making it the most violent country in the world due to the war, although life continues normally for most of its citizens as of December 2017. The war caused more than 470,000 deaths (February 2016 SCPR estimate),  7.6 million internally displaced people (July 2015 UNHCR estimate) and over 5 million refugees (July 2017 registered by UNHCR ),  making population assessment difficult in recent years. Foreign involvement in the Syrian Civil War refers to political, military and operational support to parties involved in the ongoing conflict in Syria that began in March 2011, as well as active foreign involvement. Most parties involved in the war in Syria receive various types of support from foreign countries and entities based outside Syria. The ongoing conflict in Syria is widely described as a series of overlapping proxy wars between the regional and world powers, primarily between the US and Russia as well as between Iran and Saudi Arabia. 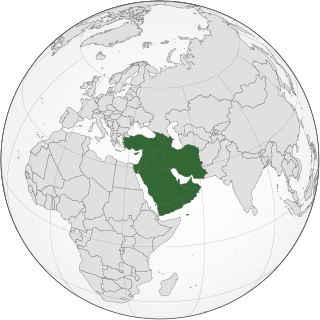 Mesopotamia is a historical region of Western Asia situated within the Tigris–Euphrates river system, in modern days roughly corresponding to most of Iraq, Kuwait, parts of Northern Saudi Arabia, the eastern parts of Syria, Southeastern Turkey, and regions along the Turkish–Syrian and Iran–Iraq borders. Sophene was a province of the ancient kingdom of Armenia and of the Roman Empire, located in the south-west of the kingdom. The region lies in what is now southeastern Turkey. Adiabene was an ancient kingdom in Assyria, with its capital at Arbela. The earliest recorded indigenous civilisation in the region was the Kingdom of Ebla  near present-day Idlib, northern Syria. Ebla appears to have been founded around 3500 BC,      and gradually built its fortune through trade with the Mesopotamian states of Sumer, Assyria, and Akkad, as well as with the Hurrian and Hattian peoples to the northwest, in Asia Minor. Gifts from Pharaohs, found during excavations, confirm Ebla's contact with Egypt. By the 21st century BC, Hurrians settled the northern east parts of Syria while the rest of the region was dominated by the Amorites, Syria was called the Land of the Amurru (Amorites) by their Assyro-Babylonian neighbors. The Northwest Semitic language of the Amorites is the earliest attested of the Canaanite languages. Mari reemerged during this period, and saw renewed prosperity until conquered by Hammurabi of Babylon. 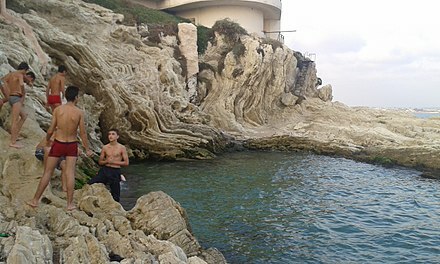 Ugarit also arose during this time, circa 1800 BC, close to modern Latakia. Ugaritic was a Semitic language loosely related to the Canaanite languages, and developed the Ugaritic alphabet,  considered to be the world's earliest known alphabet. The Ugaritic kingdom survived until its destruction at the hands of the marauding Indo-European Sea Peoples in the 12th century BC in what was known as the Late Bronze Age Collapse which saw similar kingdoms and states witness the same destruction at the hand of the Sea Peoples. 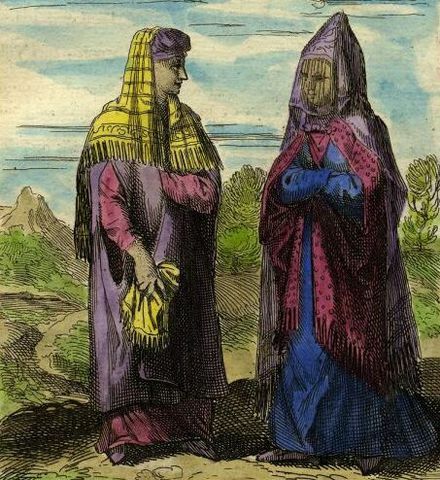 Around the 14th century BC, various Semitic peoples appeared in the area, such as the semi-nomadic Suteans who came into an unsuccessful conflict with Babylonia to the east, and the West Semitic speaking Arameans who subsumed the earlier Amorites. They too were subjugated by Assyria and the Hittites for centuries. The Egyptians fought the Hittites for control over western Syria; the fighting reached its zenith in 1274 BC with the Battle of Kadesh. The west remained part of the Hittite empire until its destruction c. 1200 BC,  while eastern Syria largely became part of the Middle Assyrian Empire,  who also annexed much of the west during the reign of Tiglath-Pileser I 1114–1076 BC. Thus, it was the Greeks who introduced the name "Syria" to the region. Originally an Indo-European corruption of "Assyria" in northern Mesopotamia, the Greeks used this term to describe not only Assyria itself but also the lands to the west which had for centuries been under Assyrian dominion. Thus in the Greco-Roman world both the Arameans of Syria and the Assyrians of Mesopotamia to the east were referred to as "Syrians" or "Syriacs", despite these being distinct peoples in their own right, a confusion which would continue into the modern world. Eventually parts of southern Seleucid Syria were taken by Judean Hasmoneans upon the slow disintegration of the Hellenistic Empire. Syrians held considerable amounts of power during the Severan dynasty. The matriarch of the family and Empress of Rome as wife of emperor Septimius Severus was Julia Domna, a Syrian from the city of Emesa (modern day Homs), whose family held hereditary rights to the priesthood of the god El-Gabal. Her great nephews, also Arameans from Syria, would also become Roman Emperors, the first being Elagabalus and the second, his cousin Alexander Severus. 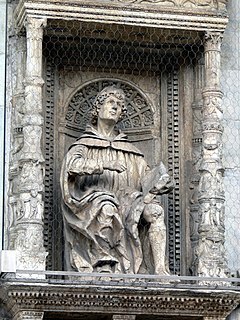 Another Roman emperor who was a Syrian was Philip the Arab (Marcus Julius Philippus), who was born in Roman Arabia. He was emperor from 244 to 249,  and ruled briefly during the Crisis of the Third Century. During his reign, he focused on his home town of Philippopolis (modern day Shahba) and began many construction projects to improve the city, most of which were halted after his death. In 1400, the Muslim Turco-Mongol conqueror Timur Lenk (Tamurlane) invaded Syria, sacked Aleppo and captured Damascus after defeating the Mamluk army. The city's inhabitants were massacred, except for the artisans, who were deported to Samarkand. Timur-Lenk also conducted specific massacres of the Aramean and Assyrian Christian populations, greatly reducing their numbers. By the end of the 15th century, the discovery of a sea route from Europe to the Far East ended the need for an overland trade route through Syria. Ottoman administration followed a system that led to peaceful coexistence. Each ethno-religious minority—Arab Shia Muslim, Arab Sunni Muslim, Aramean-Syriac Orthodox, Greek Orthodox, Maronite Christians, Assyrian Christians, Armenians, Kurds and Jews—constituted a millet. The religious heads of each community administered all personal status laws and performed certain civil functions as well. In 1831, Ibrahim Pasha of Egypt renounced his loyalty to the Empire and overran Ottoman Syria, capturing Damascus. His short-term rule over the domain attempted to change the demographics and social structure of the region: he brought thousands of Egyptian villagers to populate the plains of Southern Syria, rebuilt Jaffa and settled it with veteran Egyptian soldiers aiming to turn it into a regional capital, and he crushed peasant and Druze rebellions and deported non-loyal tribesmen. By 1840, however, he had to surrender the area back to the Ottomans. During World War I, the Ottoman Empire entered the conflict on the side of Germany and the Austro-Hungarian Empire. It ultimately suffered defeat and loss of control of the entire Near East to the British Empire and French Empire. 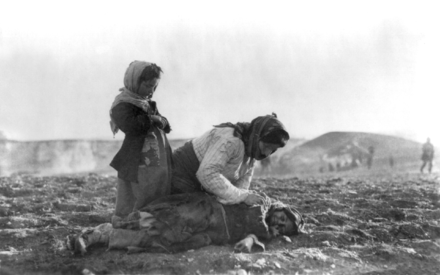 During the conflict, genocide against indigenous Christian peoples was carried out by the Ottomans and their allies in the form of the Armenian Genocide and Assyrian Genocide, of which Deir ez-Zor, in Ottoman Syria, was the final destination of these death marches. In the midst of World War I, two Allied diplomats (Frenchman François Georges-Picot and Briton Mark Sykes) secretly agreed on the post-war division of the Ottoman Empire into respective zones of influence in the Sykes-Picot Agreement of 1916. Initially, the two territories were separated by a border that ran in an almost straight line from Jordan to Iran. However, the discovery of oil in the region of Mosul just before the end of the war led to yet another negotiation with France in 1918 to cede this region to 'Zone B', or the British zone of influence. 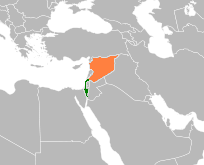 This border was recognized internationally when Syria became a League of Nations mandate in 1920  and has not changed to date. On 1 February 1958, Syrian President Shukri al-Quwatli and Egypt's Nasser announced the merging of Egypt and Syria, creating the United Arab Republic, and all Syrian political parties, as well as the communists therein, ceased overt activities. Meanwhile, a group of Syrian Ba'athist officers, alarmed by the party's poor position and the increasing fragility of the union, decided to form a secret Military Committee; its initial members were Lieutenant-Colonel Muhammad Umran, Major Salah Jadid and Captain Hafez al-Assad. 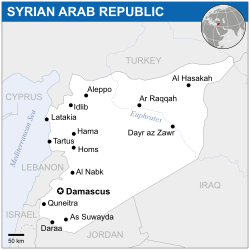 Syria seceded from the union with Egypt on 28 September 1961, after a coup. 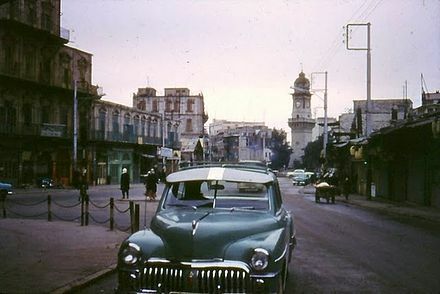 On 23 February 1966, the Military Committee carried out an intra-party overthrow, imprisoned President Amin Hafiz and designated a regionalist, civilian Ba'ath government on 1 March. Although Nureddin al-Atassi became the formal head of state, Salah Jadid was Syria's effective ruler from 1966 until November 1970,  when he was deposed by Hafez al-Assad, who at the time was Minister of Defense. 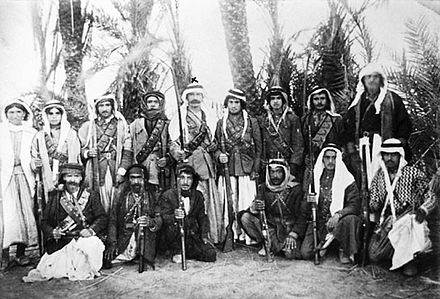 The coup led to a split within the original pan-Arab Ba'ath Party: one Iraqi-led ba'ath movement (ruled Iraq from 1968 to 2003) and one Syrian-led ba'ath movement was established. In the late 1970s, an Islamist uprising by the Muslim Brotherhood was aimed against the government. Islamists attacked civilians and off-duty military personnel, leading security forces to also kill civilians in retaliatory strikes. The uprising had reached its climax in the 1982 Hama massacre,  when some 10,000 – 40,000 people were killed by regular Syrian Army troops. 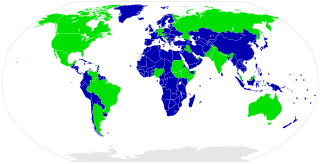 Syria is formally a unitary republic. 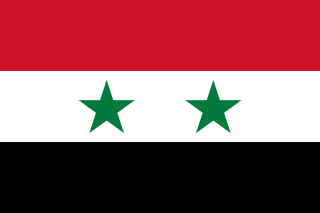 The current constitution of Syria, adopted in 2012, effectively transformed the country into a semi-presidential republic due to the constitutional right for the election of individuals who do not form part of the National Progressive Front. The President is Head of State and the Prime Minister is Head of Government. The legislature, the Peoples Council, is the body responsible for passing laws, approving government appropriations and debating policy. In the event of a vote of no confidence by a simple majority, the Prime Minister is required to tender the resignation of their government to the President. 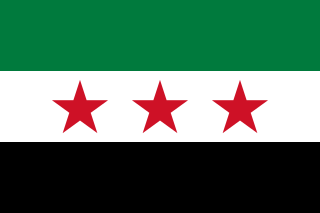 Two alternative governments formed during the Syrian Civil War, the Syrian Interim Government (formed in 2013) and the Syrian Salvation Government (formed in 2017), control portions of the north-west of the country and operate in opposition to the Syrian Arab Republic. The executive branch consists of the president, two vice presidents, the prime minister, and the Council of Ministers (cabinet). The constitution requires the president to be a Muslim  but does not make Islam the state religion. On 31 January 1973, Hafez al-Assad implemented a new constitution, which led to a national crisis. Unlike previous constitutions, this one did not require that the President of Syria be a Muslim, leading to fierce demonstrations in Hama, Homs and Aleppo organized by the Muslim Brotherhood and the ulama . They labelled Assad the "enemy of Allah" and called for a jihad against his rule. The government survived a series of armed revolts by Islamists, mainly members of the Muslim Brotherhood, from 1976 until 1982. The constitution gives the president the right to appoint ministers, to declare war and state of emergency, to issue laws (which, except in the case of emergency, require ratification by the People's Council), to declare amnesty, to amend the constitution, and to appoint civil servants and military personnel. According to the 2012 constitution, the president is elected by Syrian citizens in a direct election. Syria's legislative branch is the unicameral People's Council. Under the previous constitution, Syria did not hold multi-party elections for the legislature,  with two-thirds of the seats automatically allocated to the ruling coalition. On 7 May 2012, Syria held its first elections in which parties outside the ruling coalition could take part. Seven new political parties took part in the elections, of which Popular Front for Change and Liberation was the largest opposition party. The armed anti-government rebels, however, chose not to field candidates and called on their supporters to boycott the elections. The Emergency Law, effectively suspending most constitutional protections, was in effect from 1963 until 21 April 2011. It was justified by the government in the light of the continuing war with Israel over the Golan Heights. 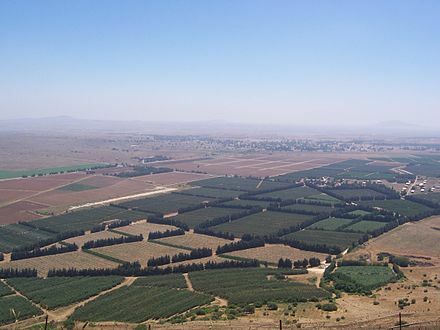 Another disputed territory is the Shebaa farms, located in the intersection of the Lebanese-Syrian border and the Israeli occupied Golan Heights. The farms, which are 11 km long and about 3 kilometers wide were occupied by Israel in 1981, along with rest of the Golan Heights. Yet following Syrian army advances the Israeli occupation ended and Syria became the de facto ruling power over the farms. Yet after Israeli withdrawal from Lebanon in 2000, Hezbollah claimed that the withdrawal was not complete because Shebaa was on Lebanese – not Syrian – territory. After studying 81 different maps, the United Nations concluded that there is no evidence of the abandoned farmlands being Lebanese. 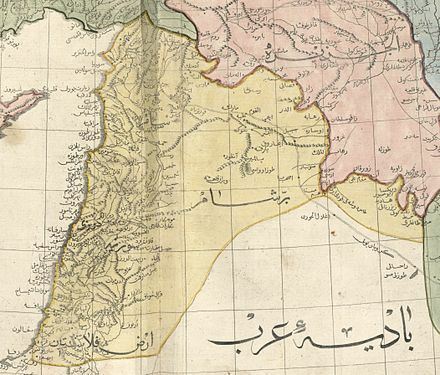 Nevertheless, Lebanon has continued to claim ownership of the territory. Agrarian reform measures were introduced into Syria which consisted of three interrelated programs: Legislation regulation the relationship between agriculture laborers and landowners: legislation governing the ownership and use of private and state domain land and directing the economic organization of peasants; and measures reorganizing agricultural production under state control. Despite high levels of inequality in land ownership these reforms allowed for progress in redistribution of land from 1958 to 1961 than any other reforms in Syria's history, since independence. 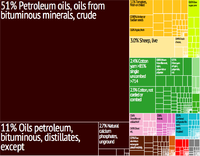 Historically, the country produced heavy-grade oil from fields located in the northeast since the late 1960s. In the early 1980s, light-grade, low-sulphur oil was discovered near Deir ez-Zor in eastern Syria. Syria's rate of oil production has decreased dramatically from a peak close to 600,000 barrels per day (95,000 m3/d) (bpd) in 1995 down to less than 182,500 bbl/d (29,020 m3/d) in 2012. Since 2012 the production has decreased even more, reaching in 2014 32,000 barrels per day (5,100 m3/d) (bpd). Official figures quantity the production in 2015 at 27,000 barrels per day (4,300 m3/d), but those figures have to be taken with precaution because it is difficult to estimate the oil that is currently produced in the rebel held areas. 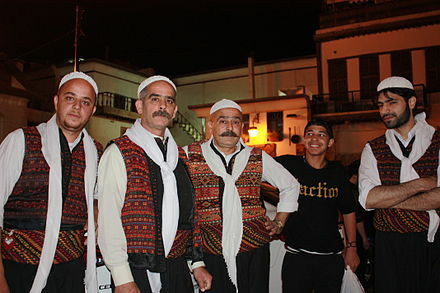 The fourth largest ethnic group are the Assyrians (3–4%),  followed by the Circassians (1.5%)  and the Armenians (1%),  most of which are the descendants of refugees who arrived in Syria during the Armenian Genocide. Syria holds the 7th largest Armenian population in the world. They are mainly gathered in Aleppo, Qamishli, Damascus and Kesab. The Syrian Arab Armed Forces are the military forces of the Syrian Arab Republic. They consist of the Syrian Arab Army, Syrian Arab Navy, Syrian Arab Air Force, Syrian Arab Air Defense Force, and several paramilitary forces, such as the National Defence Force. According to the Syrian constitution, the President of Syria is the Commander-in-Chief of the Armed Forces. Ensuring national security, increasing influence among its Arab neighbours, and securing the return of the Golan Heights, have been the primary goals of Syria's foreign policy. At many points in its history, Syria has seen virulent tension with its geographically cultural neighbours, such as Turkey, Israel, Iraq, and Lebanon. Syria enjoyed an improvement in relations with several of the states in its region in the 21st century, prior to the Arab Spring and the Syrian Civil War. Home to the Cradle of Civilization, the Middle East has seen many of the world's oldest cultures and civilizations. This history started from the earliest human settlements, continuing through several major pre- and post-Islamic Empires through to the nation-states of the Middle East today. Amin al-Hafiz was a Syrian politician, General and member of the Ba'ath Party who served as the President of Syria from 27 July 1963 to 23 February 1966. Syrian Jews derive their origin from two groups: those who inhabited Syria from early times and the Sephardim who fled to Syria after the expulsion of the Jews from Spain. There were large communities in Aleppo, Damascus, and Qamishli for centuries. In the early 20th century, a large percentage of Syrian Jews immigrated to Israel, the U.S., and Latin America. The largest Syrian-Jewish community is located in Israel and is estimated at 80,000. Al-Hajar al-Aswad is a Syrian city just 4 km (2 mi) south of the centre of Damascus in the Darayya District of the Rif Dimashq Governorate. Israel–Syria relations refers to bilateral ties between Israel and Syria. The two countries have since the establishment of the State of Israel been in a state of war. 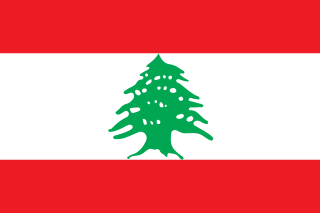 The countries have fought three major wars, which are the 1948 Arab Israeli War in 1948, the Six-Day War in 1967, and the Yom Kippur War in 1973, later also being involved in the Lebanese Civil War and the 1982 Lebanon War, as well as the War of Attrition. At other times armistice arrangements have been in place. Efforts have been made from time to time to achieve peace between the neighbouring states, without success. Syria and Iran are strategic allies. Syria is usually called Iran's "closest ally", with ideological conflict between the Arab nationalism ideology of Syria's secular ruling Ba'ath Party and the Islamic Republic of Iran's pan-Islamist policy notwithstanding. Iran and Syria have had a strategic alliance ever since the Iran–Iraq War, when Syria sided with non-Arab Iran against its fellow Baath-ruled neighbor but enemy Iraq was isolated by some Arab countries. The two countries shared a common animosity towards then Iraqi president Saddam Hussein and coordination against the United States and Israel. Syria cooperates with Iran in sending arms to Palestinian groups and Hezbollah in Lebanon, since Israel has attacked Syria. During the Syrian Civil War Iran conducted, alongside Russia, "an extensive, expensive, and integrated effort to keep Syrian President Bashar al-Assad in power." Iran, Syria, Iraq, and Russia also form an anti-terrorism alliance that has its headquarters in Baghdad. The United States and the United Kingdom have designated both nations of Iran and Syria as State Sponsors of Terrorism and listed under axis of evil, due to their alleged terrorist activities. The 2012–14 Quneitra Governorate clashes began in early November 2012, when the Syrian Army began engaging with rebels in several towns and villages of the Quneitra Governorate. The clashes quickly intensified and spilled into the UN-supervised neutral demilitarized zone between Syrian controlled territory and the Israeli-occupied Golan Heights. The Circassians in Syria refers to the Circassian diaspora, some of whom settled in Syria in the 19th century. They moved to Syria after a forced migration to the Ottoman Empire resulting from a Russian invasion in the early 1860s. Most pre-Civil War estimates put the Circassian population at around 100,000. They are predominantly Sunni Muslims. While they have become an increasingly assimilated part of Syrian society, they have maintained a distinct identity, having retained their Adyghe language, their tribal heritage and some of their traditional customs. Syria's Circassian population has dwindled with the advent of the civil war that has been ongoing in Syria since 2011. Saudi Arabia–Syria relations refer to diplomatic and economic relations between Saudi Arabia and Syria. Diplomatic ties between these two countries of the Middle East have long been strained by the major events in the region. Relations between Saudi Arabia and Syria deteriorated further following the Syrian Civil War and Saudi Arabia's numerous calls for Bashar al-Assad to be removed from power. Saudi Arabia cut off relations with Syria after they decided to close its embassy in Damascus and expel the Syrian ambassador in 2012. The following is a timeline of the Syrian Civil War from August to December 2014. Information about aggregated casualty counts is found at Casualties of the Syrian Civil War. The October War Panorama is a National museum located in Damascus, Syria which commemorates the memory of the 1973 October War between Egypt and Syria against Israel from a Syrian perspective. ↑ "SYRIA 2014 International Religious Freedom Repoert" (PDF). state.gov. U.S. Department of State. 2014. Retrieved 11 March 2018. ↑ "Constitution of Syria 2012". Scribd. 15 February 2012. Retrieved 25 January 2013. ↑ "Syrian ministry of foreign affairs". Archived from the original on 2012-05-11. 1 2 3 4 "Syria". International Monetary Fund. Retrieved 22 April 2012. ↑ "World Bank GINI index". World Bank. Retrieved 22 January 2013. ↑ "2018 Human Development Report" (PDF). United Nations Development Programme. 2017. Retrieved 15 December 2015. ↑ Gammer, Moshe (2004). The Caspian Region: The Caucasus. 2. Routledge. p. 64. ISBN 978-0203005125. ↑ MacFarquhar, Neil (12 November 2011). "Arab League Votes to Suspend Syria". The New York Times. Retrieved 12 November 2011. ↑ "Regional group votes to suspend Syria; rebels claim downing of jet". CNN. 14 August 2012. Retrieved 14 August 2012. ↑ "Syria suspends its membership in Mediterranean union". Xinhua News Agency. 1 December 2012. ↑ "Neolithic Tell Ramad in the Damascus Basin of Syria". Archive. Archived from the original on 11 November 2006. Retrieved 25 January 2013. 1 2 Michael Bröning (7 March 2011). "The Sturdy House That Assad Built". The Foreign Affairs. ↑ Rollinger, Robert (2006). "The terms "Assyria" and "Syria" again". Journal of Near Eastern Studies. 65 (4): 284–287. doi:10.1086/511103. ↑ Frye, R. N. (1992). "Assyria and Syria: Synonyms". Journal of Near Eastern Studies. 51 (4): 281–285. doi:10.1086/373570. ↑ Herodotus, The Histories , VII.63, s:History of Herodotus/Book 7. ↑ Joseph, John (2008). "Assyria and Syria: Synonyms?" (PDF). ↑ First proposed by Theodor Nöldeke in 1881; cf. Harper, Douglas (November 2001). "Syria". Online Etymology Dictionary. Retrieved 13 June 2007. ↑ Pliny. "Book 5 Section 66". Natural History. 77AD. University of Chicago. ISBN 978-84-249-1901-6. ↑ "Syria :: Roman provincial organization". Britannica Online Encyclopedia. Retrieved 25 October 2008. ↑ Pettinato, Giovanni. The Archives of Ebla; Gelb, I. J. "Thoughts about Ibla: A Preliminary Evaluation" in Monographic Journals of the Near East, Syro-Mesopotamian Studies 1/1 (May 1977) pp. 3–30. ↑ William J. Hamblin (2006). Warfare in the Ancient Near East to 1600 BC: Holy Warriors at the Dawn of History. Routledge. p. 239. ISBN 978-1-134-52062-6. ↑ Ian Shaw; Robert Jameson (2008). A Dictionary of Archaeology. John Wiley & Sons. p. 211. ISBN 978-0-470-75196-1. ↑ Ross Burns (2009). Monuments of Syria: A Guide. I.B.Tauris. p. 155. ISBN 978-0-85771-489-3. ↑ Paolo Matthiae; Nicoló Marchetti (2013-05-31). Ebla and its Landscape: Early State Formation in the Ancient Near East. Left Coast Press. p. 35. ISBN 978-1-61132-228-6. ↑ Victor Harold Matthews; Don C. Benjamin (1997). Old Testament Parallels: Laws and Stories from the Ancient Near East. Paulist Press. p. 241. ISBN 978-0-8091-3731-2. 1 2 "Syria: A country Study – Ancient Syria". Library of Congress. Retrieved 5 September 2007. ↑ Kenneth Anderson Kitchen (2003). On the Reliability of the Old Testament. Wm. B. Eerdmans Publishing. p. 285. ISBN 978-0-8028-4960-1. ↑ Stephen C. Neff (2014). Justice among Nations. Harvard University Press. p. 14. ISBN 978-0-674-72654-3. ↑ "The Aramaic Language and Its Classification" (PDF). Journal of Assyrian Academic Studies . 14 (1). ↑ Trevor Bryce (2014). Ancient Syria: A Three Thousand Year History. OUP Oxford. p. 16. ISBN 978-0-19-100292-2. ↑ Cyrus Herzl Gordon; Gary Rendsburg; Nathan H. Winter (1990). Eblaitica: Essays on the Ebla Archives and Eblaite Language, Volume 4. p. 68. ISBN 978-1-57506-060-6. ↑ John F. Healey (1990). The Early Alphabet. University of California Press. p. 22. ISBN 978-0-520-07309-8. ↑ "jabbul head louvre". Louvre.fr. Retrieved 24 July 2014. 1 2 Stephanie Dalley (2002). Mari and Karana: Two Old Babylonian Cities. p. 44. ISBN 9781931956024. ↑ Nadav Naʼaman (2005). Canaan in the Second Millennium B.C.E. Eisenbrauns. p. 285. ISBN 978-1-57506-113-9. ↑ Iorwerth Eiddon Stephen Edwards (1973). The Cambridge Ancient History. Cambridge University Press. p. 32. ISBN 978-0-521-08230-3. ↑ William J. Hamblin (2006). 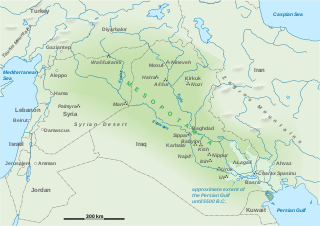 Warfare in the Ancient Near East to 1600 BC. Routledge. p. 259. ISBN 978-1-134-52062-6. ↑ Jack M. Sasson (1969). The Military Establishments at Mari. p. 2+3. ↑ John Lange (2006). The Philosophy of Historiography. Open Road Integrated Media, Incorporated. p. 475. ISBN 978-1-61756-132-0. ↑ Immanuel Velikovsky (2010). Ramses II and His Time. p. 23. ISBN 9781906833749. ↑ Douglas Frayne (1981). 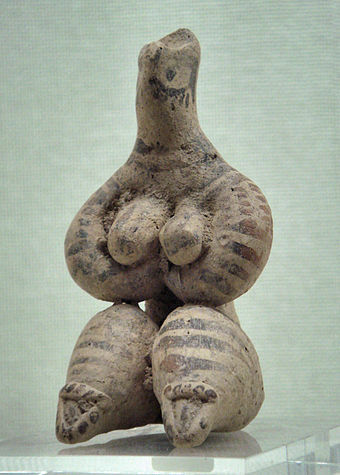 Ugarit in Retrospect. p. 23,24,25. ISBN 9780931464072. ↑ Rollinger, Robert (2006). "The terms "Assyria" and "Syria" again" (PDF)". Journal of Near Eastern Studies. 65 (4): 284–287. doi:10.1086/511103. ↑ Charlotte Higgins. "When Syrians, Algerians and Iraqis patrolled Hadrian's Wall". the Guardian. 1 2 Cavendish Corporation, Marshall (2006). World and Its Peoples. Marshall Cavendish. p. 183. ISBN 978-0-7614-7571-2. ↑ Mubarakpuri, The Sealed Nectar, pp. 193–194. ↑ "Syria: History". Encyclopædia Britannica. Retrieved 25 January 2013. ↑ Farhad Daftary. A Short History of the Ismailis. 1998, Edinburg, UK. Edinburg University Press. Page 146. ↑ Timeframe AD 1200–1300: The Mongol Conquests. Time-Life Books. 1989. pp. 59–75. ISBN 978-0-8094-6437-1. ↑ "Battle of Aleppo". Everything2.com. 22 February 2003. Retrieved 25 January 2013. 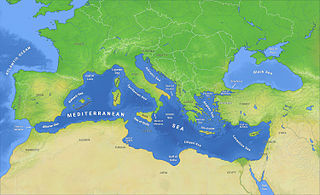 ↑ "The Eastern Mediterranean, 1400–1600 A.D". Metmuseum.org. Archived from the original on 28 April 2009. Retrieved 23 April 2011. 1 2 "Syria – Ottoman". Library of Congress Country Studies. Retrieved 25 January 2013. ↑ a b Stanford J. Shaw, "Dynamics of Ottoman Society and administration", in "History of the Ottoman Empire and Modern Turkey"
↑ Pouring a People into the Desert:The "Definitive Solution" of the Unionists to the Armenian Question, Fuat Dundar, A Question of Genocide, ed. Ronald Grigor Suny, Fatma Muge Gocek and Norman M. Naimark, (Oxford University Press, 2011), 280–281. ↑ "Mandat Syrie-Liban" (PDF) (in French). Archived from the original (PDF) on 26 June 2008. Retrieved 25 January 2013. ↑ James Barr (2011). a line in the sand. Britain, France and the struggle that shaped the Middle East. Simon & Schuster. ISBN 978-1-84737-453-0. ↑ Peter N. Stearns; William Leonard Langer (2001). "The Middle East, p. 761". The Encyclopedia of World History. Houghton Mifflin Books. ISBN 978-0-395-65237-4. 1 2 3 4 5 6 7 "Background Note: Syria". United States Department of State, Bureau of Near Eastern Affairs, May 2007. 1 2 3 4 5 6 7 8 9 "Syria: World War II and independence". Britannica Online Encyclopedia. ↑ Robson, John (10 February 2012). "Syria hasn't changed, but the world has". Toronto Sun. Retrieved 25 January 2013. ↑ Brecher, Michael; Jonathan Wilkenfeld (1997). A Study of Crisis. University of Michigan Press. pp. 345–346. ISBN 978-0-472-10806-0. ↑ "Salah Jadid, 63, Leader of Syria Deposed and Imprisoned by Assad". The New York Times. 24 August 1993. 1 2 Seale, Patrick (1988). Asad: The Struggle for the Middle East. University of California Press. ISBN 978-0-520-06976-3. ↑ Mark A. Tessler (1994). A History of the Israeli-Palestinian conflict. Indiana University Press. p. 382. ISBN 978-0-253-20873-6. ↑ "A Campaign for the Books". Time. 1 September 1967. ↑ Line Khatib (23 May 2012). 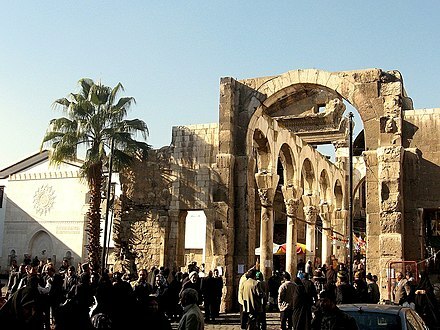 Islamic Revivalism in Syria: The Rise and Fall of Ba'thist Secularism. Routledge. p. 34. ISBN 978-0-415-78203-6. ↑ "Jordan asked Nixon to attack Syria, declassified papers show". CNN. 28 November 2007. Retrieved 25 October 2008. ↑ Rabinovich, Abraham (2005). The Yom Kippur War: The Epic Encounter That Transformed the Middle East. New York City: Schocken Books. p. 302. ISBN 978-0-8052-4176-1. ↑ Itzchak Weismann. "Sufism and Sufi Brotherhoods in Syria and Palestine". University of Oklahoma. Retrieved 30 January 2013. ↑ Marc Perelman (11 July 2003). "Syria Makes Overture Over Negotiations". Forward.com. Retrieved 25 October 2008. ↑ George, Alan (2003). Syria: neither bread nor freedom. London: Zed Books. pp. 56–58. ISBN 978-1-84277-213-3. ↑ Ghadry, Farid N. (Winter 2005). "Syrian Reform: What Lies Beneath". The Middle East Quarterly. ↑ "Profile: Syria's Bashar al-Assad". BBC News. Retrieved 25 October 2008. ↑ Huggler, Justin (6 October 2003). "Israel launches strikes on Syria in retaliation for bomb attack". The Independent. London. Archived from the original on 15 May 2011. Retrieved 23 October 2008. ↑ "Naharnet Newsdesk – Syria Curbs Kurdish Riots for a Merger with Iraq's Kurdistan". Naharnet.com. Retrieved 25 October 2008. ↑ Guerin, Orla (6 March 2005). "Syria sidesteps Lebanon demands". BBC News. Retrieved 28 April 2010. ↑ Sanger, David (14 October 2007). 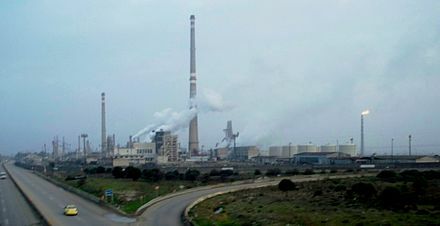 "Israel Struck Syrian Nuclear Project, Analysts Say". The New York Times. Retrieved 15 October 2007. ↑ "Syrian army tanks 'moving towards Hama'". BBC News. 10 May 2011. Retrieved 18 May 2015. ↑ Sengupta, Kim (20 February 2012). 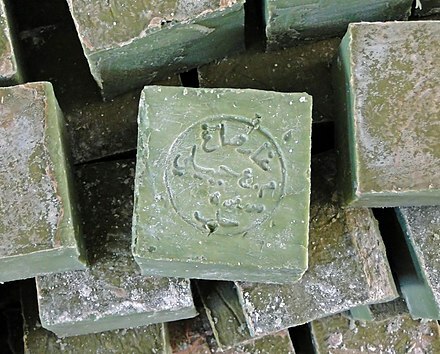 "Syria's sectarian war goes international as foreign fighters and arms pour into country". The Independent. Antakya. Retrieved 22 February 2012. 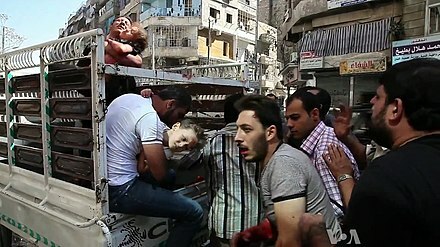 ↑ "Syria deaths near 100,000, says U.N. – and 6,000 are children". The Guardian. 13 June 2013. ↑ Carsten, Paul (15 March 2012). "Syria: Bodies of 23 'extreme torture' victims found in Idlib as thousands rally for Assad". The Daily Telegraph. Retrieved 25 January 2013. ↑ "Arab League delegates head to Syria over 'bloodbath'. USA Today. (22 December 2011). Retrieved 26 June 2012". USA Today. 22 December 2011. Retrieved 25 January 2013. ↑ "United Nations High Commissioner for Refugees (UNHCR)". UNHCR Global Trends 2015. United Nations. Retrieved 15 September 2016. ↑ Location Settings (12 March 2012). "Syria: Refugees brace for more bloodshed". News24.com. Retrieved 25 January 2013. ↑ Lara Jakes And Yahya Barzanji (14 March 2012). "Syrian Kurds get cold reception from Iraqi Kurds". Yahoo! News. Retrieved 30 January 2013. ↑ "Syria crisis: number of refugees tops 1.5 million, says UN". The Guardian. 16 May 2013. ↑ Syria Regional Refugee Response – Demographic Data of Registered Population. UNHCR. ↑ "Syrian Civil War Causes One-Third of Country’s Christians to Flee Their Homes ". The Algemeiner Journal. 18 October 2013. ↑ Library, CNN. "Syrian Civil War Fast Facts". ↑ F. A. Schaeffer, Claude (2003). Syria and the Cradle of Civilization: The Findings of Claude F a Schaeffer in Ras Shamra. Trubner & Company. ISBN 978-1-84453-129-5. ↑ "Constitution of Syria. Articles 58–59". Scribd.com. 15 February 2012. Retrieved 30 January 2013. ↑ "Constitution of Syria. Articles 83–118". Scribd.com. 15 February 2012. Retrieved 30 January 2013. ↑ "Constitution of Syria. Article 75(1)2)(4)". Scribd.com. 15 February 2012. Retrieved 30 January 2013. ↑ "Constitution of Syria. Article 77(2)". Scribd.com. 15 February 2012. Retrieved 30 January 2013. ↑ "Constitution of Syria" . Retrieved 22 October 2008. ↑ Alianak, Sonia (2007). 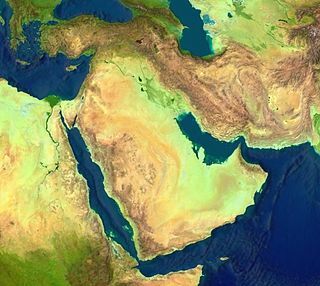 Middle Eastern Leaders and Islam: A Precarious Equilibrium. Peter Lang. p. 55. ISBN 978-0-8204-6924-9. 1 2 3 "Syria (05/07)". State.gov. Retrieved 25 October 2008. ↑ "Syria: Elections without Politics". Carnegie Endowment. ↑ "Syria clamps down on Kurd parties". BBC News. 3 June 2004. Retrieved 22 October 2008. 1 2 "Decrees on Ending State of Emergency, Abolishing SSSC, Regulating Right to Peaceful Demonstration". Syrian Arab News Agency. 22 April 2011. Archived from the original on 28 March 2012. Retrieved 30 January 2013. ↑ "Syria". Carnegie Endowment for International Peace. p. 13. ↑ "Syria (Syrian Arab Republic)". Law.emory.edu. Retrieved 18 February 2013. ↑ Black, Ian (26 March 2013). "Syrian opposition takes Arab League seat". The Guardian. ↑ "Syria conflict: UK recognises opposition, says William Hague". BBC. 20 November 2012. Retrieved 28 August 2013. ↑ Hugh Schofield (13 November 2012). "Syria: France backs anti-Assad coalition". BBC. Retrieved 28 August 2013. ↑ Madhani, Aamer (12 December 2012). "Obama says U.S. will recognize Syrian opposition". USA Today. ↑ Αϊβαλιώτης, Γιώργος (13 April 2016). "Συρία: Βουλευτικές εκλογές για την διαπραγματευτική ενίσχυση Άσαντ". euronews.com. ↑ "Εκλογές στη Συρία, ενώ η εμπόλεμη κατάσταση παραμένει". efsyn.gr. 13 April 2016. ↑ "Freedom on the world report". Freedomhouse.org. Retrieved 25 January 2013. ↑ "Syria among worst for rights abuses: HRW report". Reuters. 24 January 2011. ↑ "Freedom in the World Report: Syria". January 2011. 1 2 "Syria: Events of 2008". Human Rights Watch. ↑ Joe Lauria (29 November 2011). "More than 250 children among dead, U.N. says". The Wall Street Journal. Retrieved 29 November 2011. ↑ "UN report: Syrian forces commit 'gross violations' of human rights, CNN". 29 November 2011. ↑ "200 massacred in Hama, claim Syrian activists". 13 July 2012. ↑ "Iran warns west against military intervention in Syria". The Guardian. Retrieved 28 August 2013. ↑ Güsten, Susanne (13 February 2013). "Christians Squeezed Out by Violent Struggle in North Syria". The New York Times. ↑ Behari, Elad (23 December 2011). "Syria: Sunnis Threatening to Massacre Minority Alawites". Arutz Sheva. ↑ Griffin, Jennifer (6 April 2017). "US launches missiles into Syria in response to chemical weapons attack". ↑ "Deadly nerve agent sarin used in Syria attack, Turkish Health Ministry says". 1 2 John Pike. 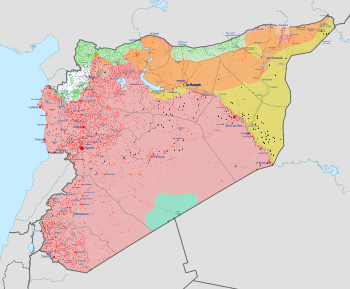 "Syria – Overview". Globalsecurity.org. Retrieved 30 January 2013. ↑ "Syria reduces compulsory military service by three months". China Daily. 20 March 2011. Archived from the original on 3 May 2011. Retrieved 23 April 2011. ↑ Strenger, Carlo (8 February 2012). "Assad takes a page out of Russia's book in his war against rebels". Haaretz. Retrieved 15 January 2013. ↑ Morris, Chris (2005). "Chapter 9: Crossroads". The New Turkey. London: Granta Books. pp. 203–227. ISBN 978-1-86207-865-9. ↑ "'The jungle is back.' With his Golan Heights tweet, Trump emboldens the annexation agendas of the world's strongmen". The Globe and Mail. March 22, 2019. ↑ "Israeli views on Shebaa Farms harden". BBC News. 25 August 2006. ↑ "Shebaa Farms – nub of conflict". Ynetnews. 8 October 2006. ↑ "Har Dov withdrawal not on the table". The Jerusalem Post. 1 2 3 4 Heydemann, Steven. Authoritarianism in Syria. Ithaca: Cornell UP, 1999. Print. ↑ Heydemann, Steven. Authoritarianism in Syria. Ithaca: Cornell UP, 1999. Print. Pg 111. ↑ "وزارة الاتصالات والتقانة". Moct.gov.sy. Archived from the original on 20 August 2013. Retrieved 28 August 2013. ↑ "AT&T – 4G LTE, Cell Phones, U-verse, TV, Internet & Phone Service". Ste.gov.sy. Archived from the original on 23 July 2013. Retrieved 28 August 2013. ↑ Katerji, Oz (4 April 2013). "The Syrian Electronic Army Are at Cyber War with Anonymous". Vice.com. Retrieved 28 August 2013. ↑ Eissa, T; Cho, Gi-Hwan (2013). Internet Anonymity in Syria, Challenges and Solution. Lecture Notes in Electrical Engineering. 215. pp. 177–186. doi:10.1007/978-94-007-5860-5_21. ISBN 978-94-007-5859-9. 1 2 "Syria regime revenues shrink as losses mount". The Daily Star. AFP. 30 May 2015. Retrieved 31 May 2015. ↑ "Iran spends billions to prop up Assad". TDA. Bloomberg. 11 June 2015. Retrieved 11 June 2015. ↑ "Syria's economy cut in half by conflict". BBC News. 23 June 2015. Retrieved 24 June 2015. ↑ "Country and Lending Groups". World Bank. Archived from the original on 18 March 2011. Retrieved 26 July 2012. 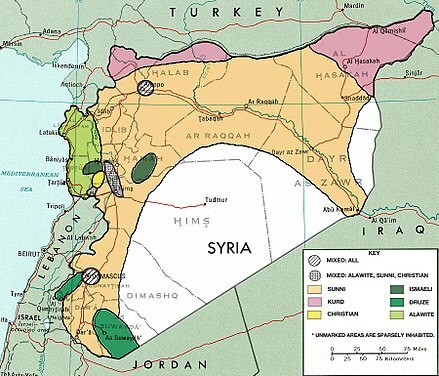 1 2 3 "Syria Country Brief, September 2010" (PDF). World Bank. ↑ Transactions of the American Institute of Mining and Metallurgical Engineers. The Institute of Mining and Metallurgical Engineers. 1921. 1 2 "Syria Weighs Its Tactics as Pillars of Its Economy Continue to Crumble". The New York Times. 13 July 2013. Retrieved 13 July 2013. 1 2 3 "Syria". The World Factbook . 2007. 1 2 3 "Economic Challenges and Reform Options for Syria: A Growth Diagnostics Report" (PDF). World Bank. 21 February 2011. p. 10. 1 2 "Syria". Index of Economic Freedom. ↑ "Syria reverts to socialist economic policies to ease tension". Reuters. 4 July 2012. Retrieved 27 October 2012. 1 2 3 "Syria's battling economy may hold on with help from friends". Agence France-Presse. Archived from the original on 23 August 2012. Retrieved 28 August 2012. ↑ "Syria's ailing economy hits citizens and regime". Financial Times. 6 February 2012. Retrieved 24 August 2012. ↑ "Syrian Economy To Shrink By 20 Percent in 2012 As Country Struggles With War". Huffington Post. 12 October 2012. ↑ "Syrians struggle with shortages as economy buckles". Associated Press. 22 January 2013. Archived from the original on 13 May 2013. 1 2 3 4 "The Syrian Economy: Hanging by a Thread". Carnegie Endowment for International Peace. 20 June 2012. ↑ Sherlock, Ruth (27 May 2015). "Isil seizes Syrian regime's lucrative phosphate mines". The Telegraph. Retrieved 11 June 2015. ↑ "IS blows up Syria gas pipeline serving capital: monitor". Yahoo News. AFP. 10 June 2015. Retrieved 11 June 2015. ↑ Shaheen, Kareem (11 June 2015). "String of losses in Syria leaves Assad regime increasingly precarious". The Guardian. Retrieved 11 June 2015. ↑ Al-Khalidi, Suleiman (27 January 2015). "Syria raises fuel prices to snuff out black market, soothe unrest". Reuters. Retrieved 28 January 2015. ↑ "Syria's oil production on Index Mundi" . Retrieved 15 October 2016. ↑ "How to travel by train from London to Syria | Train travel in Syria". Seat61.com. Retrieved 25 October 2008. ↑ "Syria". The World Factbook. CIA. ↑ "World Population Prospects - Population Division - United Nations". ↑ "Population Existed in Syria According To Censuses (1960, 1970, 1981, 1994, 2004) And Estimates of Their Number in Mid Years 2005–2011(000)". Central Bureau of Statistics. Archived from the original on 23 October 2015. Retrieved 18 October 2015. ↑ "World Refugee Survey 2008". U.S. Committee for Refugees and Immigrants. 19 June 2008. Archived from the original on 28 December 2012. ↑ Politi, Daniel (30 August 2014). "U.N.: Syria Crisis Is 'Biggest Humanitarian Emergency of Our Era'". Slate . Retrieved 1 September 2014. ↑ Nebehay, Stephanie (29 August 2014). "Syrian refugees top 3 million, half of all Syrians displaced – U.N." Reuters. Retrieved 29 August 2014. ↑ "Demographic Data of Registered Population". UNHCR. Retrieved 29 August 2014. ↑ Richards, M; Rengo, C; Cruciani, F; Gratrix, F; Wilson, JF; Scozzari, R; MacAulay, V; Torroni, A (2003). "Extensive Female-Mediated Gene Flow from Sub-Saharan Africa into Near Eastern Arab Populations". American Journal of Human Genetics. 72 (4): 1058–1064. doi:10.1086/374384. PMC 1180338 . PMID 12629598. ↑ "In the Wake of the Phoenicians: DNA study reveals a Phoenician-Maltese link". National Geographic Magazine. October 2004. Retrieved 30 January 2013. ↑ "The World Factbook". CIA. Retrieved 1 July 2018. ↑ "Syria's Assyrians threatened by extremists – Al-Monitor: the Pulse of the Middle East". Al-Monitor. Retrieved 24 July 2014. ↑ "Turkey-Syria deal allows Syriacs to cross border for religious holidays". Today's Zaman. 26 April 2008. Archived from the original on 11 May 2011. Retrieved 23 April 2011. 1 2 "Syria – Kurds". Library of Congress Country Studies . 1 2 3 4 5 6 7 Khalifa, Mustafa (2013), The impossible partition of Syria, Arab Reform Initiative, pp. 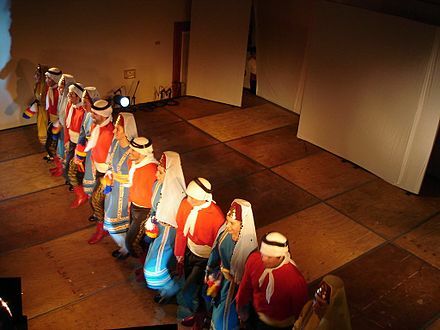 3–5, Arabs constitute the major ethnic group in Syria, making up between 80 and 85% of the population. ↑ BBC (2015). "Who are the Turkmen in Syria?". There are no reliable population figures, but they are estimated to number between about half a million and 3.5 million. ↑ The New York Times (2015). "Who Are the Turkmens of Syria?". Q. How many are there? A. No reliable figures are available, and estimates on the number of Turkmens in Syria and nearby countries vary widely, from the hundreds of thousands up to 3 million or more. ↑ "The Arabs of Brazil". Saudi Aramco World. September–October 2005. Archived from the original on 26 November 2005. Retrieved 30 January 2013. ↑ United Nations High Commissioner for Refugees. "UN refugee agency welcomes Brazil announcement of humanitarian visas for Syrians". Unhcr.org. Retrieved 24 July 2014. ↑ "Inmigracion sirio-libanesa en Argentina" (in Spanish). Confederación de Entidades Argentino Árabes. Archived from the original on 20 June 2010. Retrieved 30 January 2013. 1 2 3 4 "Syria – International Religious Freedom Report 2006". U.S. Department of State. 2006. Retrieved 28 June 2009. ↑ Danna, Nissim (December 2003). The Druze in the Middle East: Their Faith, Leadership, Identity and Status. Brighton: Sussex Academic Press. p. 227. ISBN 978-1-903900-36-9. ↑ Pipes, Daniel (1 January 1989). "The Alawi Capture of Power in Syria". Middle Eastern Studies. 25 (4): 429–450. doi:10.1080/00263208908700793. JSTOR 4283331. ↑ "Death toll in Syria likely as high as 120,000: group". Reuters. 14 May 2013. ↑ Tomader Fateh (25 October 2008). "Patriarch of Antioch: I will be judged if I do not carry the Church and each one of you in my heart". Forward Magazine. Archived from the original on 2 March 2010. Retrieved 30 January 2013. ↑ Hopwood, Derek (1988). 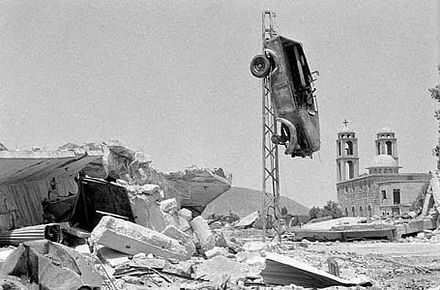 Syria 1945–1986: Politics and Society. Routledge. ISBN 978-0-04-445039-9. ↑ Salamandra, Christa (2004). 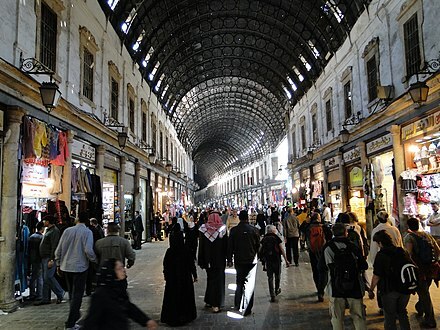 A New Old Damascus: Authenticity and Distinction in Urban Syria. Indiana University Press. p. 103. ISBN 978-0-253-21722-6. ↑ Salti, Rasha (2006). Insights into Syrian Cinema: Essays and Conversations with Contemporary Filmmakers. ArteEast. ISBN 978-1-892494-70-2. ↑ "Freedom House report on Syria (2010)" (PDF). Freedom House. Archived from the original (PDF) on 27 December 2010. ↑ "Akram Raslan: How Caricatures Shake Tyranny". Syria Untold. 13 April 2015. Retrieved 23 September 2015. ↑ "Damascus". Raidió Teilifís Éireann. 15 October 2009. Archived from the original on 4 December 2009. Retrieved 26 November 2009. ↑ "U.S. Relations With Syria". State.gov. 24 October 2012. Retrieved 25 January 2013. ↑ "Syria's Education System – Report – June 2001" (PDF). Archived from the original (PDF) on 11 May 2011. Retrieved 23 April 2011. ↑ "Syria – Education". Countrystudies.us. Retrieved 25 October 2008. 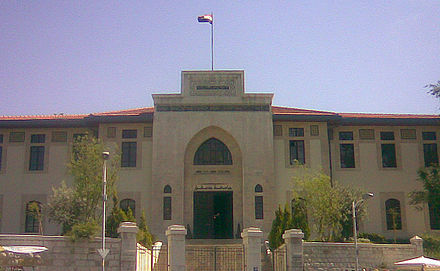 ↑ Ministry of Higher Education (23 November 2011). "Public universities". Ministry of Higher Education. Archived from the original on 5 August 2012. Retrieved 22 January 2013. ↑ "Private universities". Ministry of Higher Education. 23 November 2011. Archived from the original on 13 November 2012. Retrieved 22 January 2013. ↑ "Forward Magazine, Interview with President of Damascus University". February 2008. Archived from the original on 18 June 2008. ↑ "Getting education right". March 2008. Archived from the original on 3 October 2010. ↑ "Syrian Arab Republic". Ranking Web of Universities. Retrieved 26 February 2013. ↑ "Health". SESRIC. Archived from the original on 13 May 2013. Retrieved 5 March 2013. ↑ "Demography". SESRIC. Retrieved 5 March 2013. Maoz, M. (1986). Yaniv, A, ed. Syria Under Assad. ISBN 978-0-312-78206-1. "Syria". The World Factbook . Central Intelligence Agency.